Arsenal halved the gap between themselves and London rivals Chelsea as they beat the Blues 2-0. Kicking off late at the Emirates Stadium, Arsenal dominated their fellow top-four contenders to take all three points. It was a much-needed win Unai Emery’s side, given their recent poor form and all the controversy emanating from the boardroom. Goals from Alexandre Lacazette and Laurent Koscielny ensured that Arsenal were rewarded for an excellent performance against a top side in the Premier League. Maurizio Sarri‘s Chelsea were lethargic and lacklustre, a point he criticised in his post-match press conference. Chelsea’s toothless attack barely threatened the home side all night and struggled to create many significant chances. 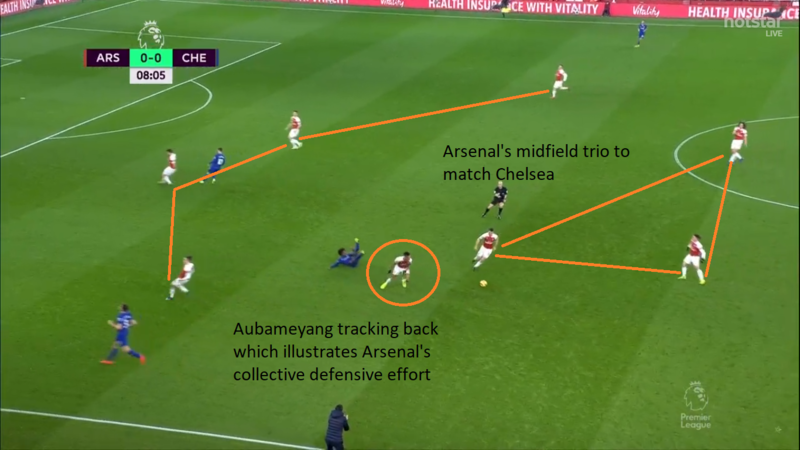 Weak links in this Chelsea side were once again evident as Arsenal’s tactical set-up countered Chelsea’s strengths and exposed their weaknesses. A criticism levelled on Emery is that his side do not yet have a clear identity in terms of their style of play. 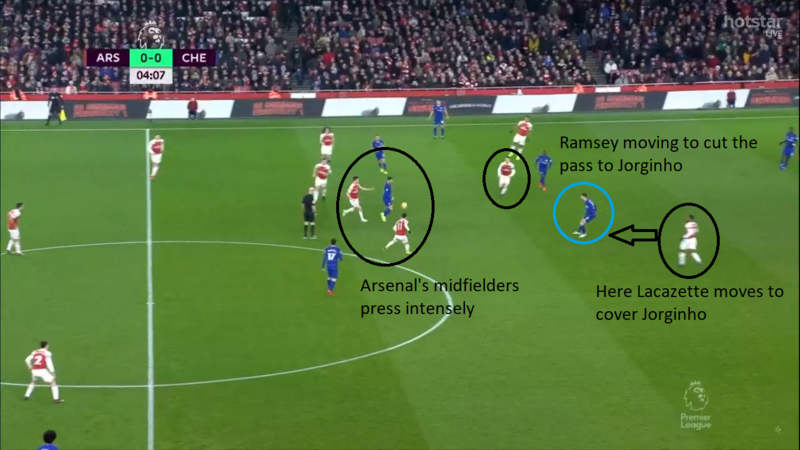 Against Chelsea, Arsenal finally showed that they can operate as a pressing side. From the onset, the Gunners harried and pressed Chelsea whenever the visitors had the ball. This pressing was especially concentrated on David Luiz and Jorginho. Both Luiz and Jorginho are renowned for their passing, with the former capable of playing dangerous diagonal balls or aerial through balls for Chelsea’s speedy attack to latch onto. Jorginho is integral to the Sarriball system, operating from deep. Emery had obviously set his side up with clear instructions to press their opponents. This reaped dividends as Jorginho was virtually ineffective the whole game, Luiz was forced into many errors and Chelsea, generally, struggled to play out from the back. The above image illustrates Arsenal’s pressing right from the start of the game. Chelsea’s usual passing patterns and attacking outlets were disrupted. Emery’s team selection was a testament to the way he wanted his side to play. Ramsey started in the number 10 role but offered so much more. Positioning himself between the lines, he didn’t offer Jorginho any space or time with his relentless pressing. The Welshman was a great choice to start by Emery as he offered much more defensively than Ozil would have if he had started. Arsenal’s bite and aggression was very important. The strike duo of Lacazette and Aubameyang put in their work as well, tracking back regularly and initiating the press. 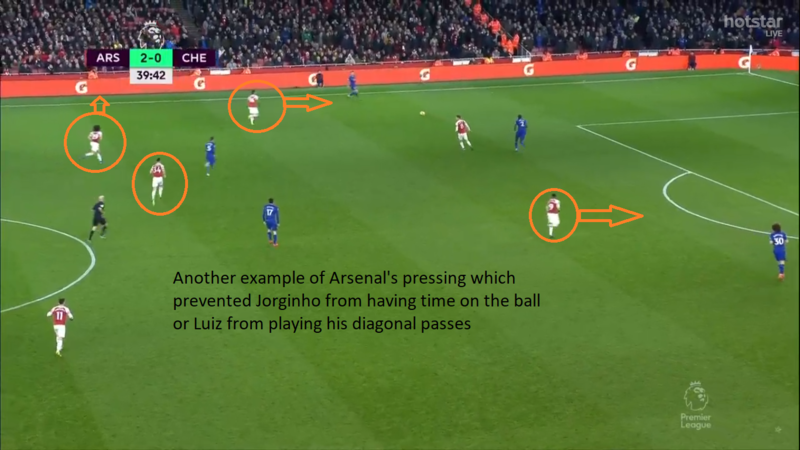 On this occasion, Arsenal’s attack moves to cut out the pass to either Jorginho or Luiz. This forces Chelsea to go back to the keeper. As one of Arsenal’s forwards presses the keeper, he’s forced to go long. Arsenal won the midfield battle, and as a consequence won the game. Emery was expected to set his side up in a 3-4-3 as they did against West Ham the previous week. 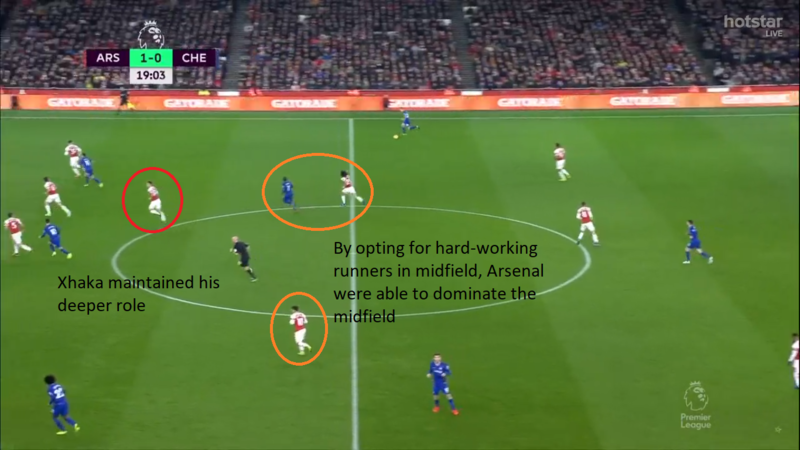 Understanding the threat posed by Chelsea’s three-man midfield overrunning Arsenal, the Spaniard switched to a four-man defence as he sought to dominate the numbers in midfield. Numerical superiority in midfield not only stifled Chelsea, but also benefited Arsenal’s midfielders. They often struggle to impose themselves when their side play a three-man defence. Granit Xhaka slotted into his usual deeper role, looking comfortable. Powerful runners in Torreira, Guendouzi and Ramsey operated in front of him which offered additional protection. 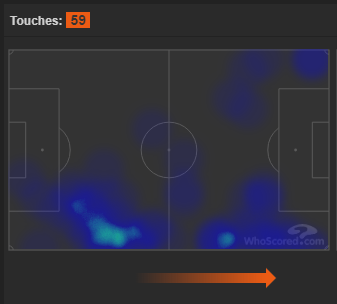 Torreira and Guendouzi played on the right and left sides of midfield respectively and were very efficient in supporting the Arsenal full-backs from the threat posed by Chelsea’s wingers. 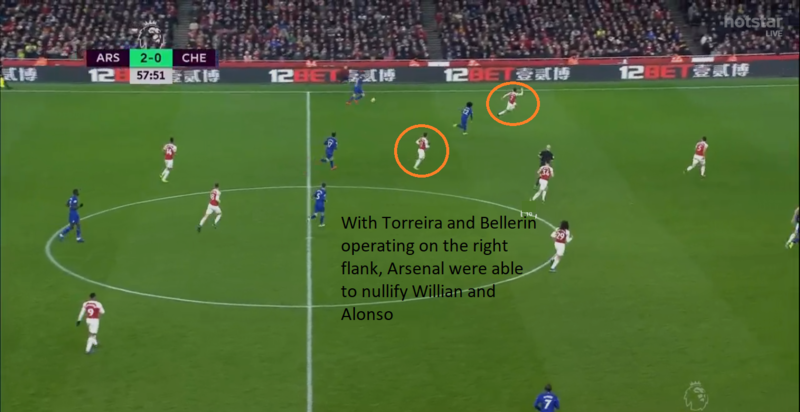 Torreira and Bellerin were excellent in keeping the marauding Marcos Alonso at bay. Lucas Torreira’s importance to this side cannot be understated. In his usual all-action performance, the Uruguayan managed 38 passes, attempted 12 tackles and made three clearances. Arsenal looked dangerous every time they got forward in numbers. This system looks to be the one that best suits Emery’s side. Defensively, Arsenal were solid on the night, keeping a clean sheet. Behind this was an immense performance by captain Laurent Koscielny. The veteran has taken a while to return to form after his long term injury, but put in a man-of-the-match performance and scored a goal as well. He made 13 interceptions, three clearances and an important block at point-blank range. His partnership with Sokratis was encouraging to see. It looked far more solid than when the error-strewn Mustafi features in the side. The aid the defence received from midfield was also key in keeping the clean sheet. Defensive duo Koscielny and Sokratis were complementary in their aggression and intent to win aerial duels. Overall, the back four was well balanced. The full-backs Bellerin and Kolasinac were not too eager to get forward, balancing defence and attack well. Kolasinac especially performed his defensive duties well. When not in possession, Arsenal resorted to a diamond in midfield. The three midfielders, as well as a more advanced Ramsey, played an important role in shielding their defence. The trio frequently created 2v1 scenarios for the Chelsea wingers, supporting their full-backs and preventing the opposition from crossing or cutting inside. Hector Bellerin’s injury dampened what was otherwise an important win for Arsenal. The Spaniard was stretchered off in the second half with what looks like a serious injury that could keep him out for the rest of the season. Bellerin has quietly developed into one of the most improved players under Emery. Consistent performances week after week have made Bellerin an integral part of the Arsenal system, especially when they are so reliant on overlapping play. His defensive and spatial awareness has improved as well. He has committed fewer positional errors and been more responsible in his defensive duties. With five assists in the Premier League this season, Bellerin’s attacking output will be dearly missed in his absence. While Arsenal were great on the night, familiar issues resurfaced for a dull Chelsea side. The Blues began the season with an aura of optimism around a forward-thinking and tactically astute coach in Maurizio Sarri. Jorginho was heralded as the league’s pass master and midfield metronome, Hazard was in blistering form and Chelsea looked like a balanced side. That narrative has drastically changed with Chelsea’s struggles. 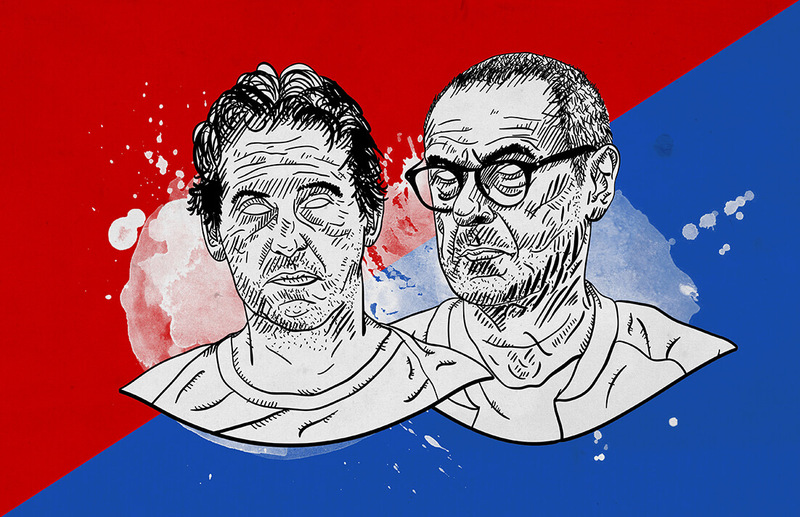 Sarri is far too one-dimensional at the moment, which teams are quick to capitalise on. Simply marking Jorginho out of the game stifles Chelsea. This, coupled with Giroud and Morata’s struggles in front of goal, mean that Chelsea are currently utilising a system that looks far from effective. Arsenal killed any influence Jorginho could have had by assigning Ramsey to mark him. Hazard played as a false nine but was no match physically for the robust duo of Sokratis and Koscielny. Defensively, Chelsea were all over the place. Two culprits for this were Alonso and Luiz. Alonso abandoned all his defensive duties and frequently took up positions near and inside the Arsenal penalty area. Bellerin and Aubameyang’s pace on the right wing combined with Alonso’s irresponsibility left Chelsea exposed. With N’Golo Kante tasked with a more advanced role in midfield, Chelsea’s defence need to sort themselves out as they no longer completely have the added insurance that he offers. 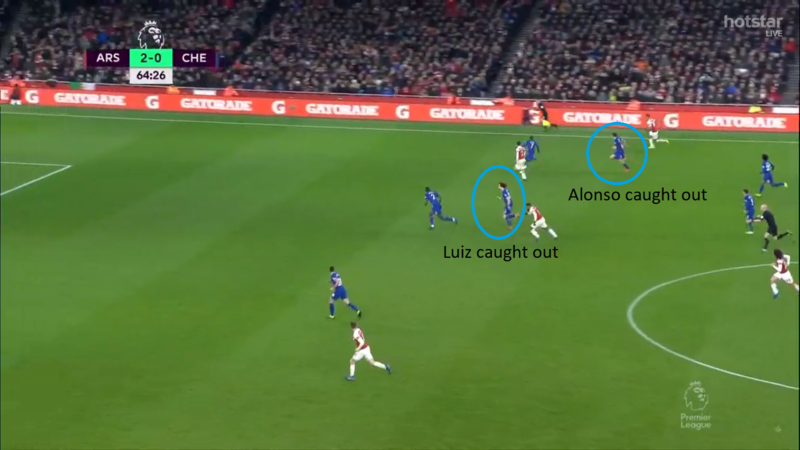 Chelsea’s usual defensive culprits in Alonso and Luiz are caught out of position in their enthusiasm to contribute more to attack than actually defend. The Premier League, being the unforgiving environment that it is, demands the best from coaches. A back-up plan is a bare minimum if one is to survive as the head coach of a Premier League side, something Sarri lacks and has been criticised for in the past. Chelsea are far too predictable even before the game kicks off. A vital win for Arsenal keeps their top-four hopes alive after a difficult past couple of weeks. Unai Emery’s side deservedly dispatched their London rivals after putting in a performance of aggression, solidity and passion. This win is bound to give the side a great deal of confidence with fixtures against Manchester United and Manchester City on the horizon. For Maurizio Sarri and Chelsea, the disappointing loss was another indicator that they are too predictable and one-dimensional. They are also in desperate need of a centre-forward. Sarri needs to address these recurring issues at the earliest opportunity if Chelsea are to hold off Arsenal and United and finish in the top four.